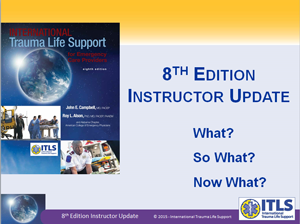 ITLS is proud to present the ITLS 8th Edition Instructor Update, a tool for ITLS instructors to update to the 8th edition ITLS provider manual. The 8th Edition Instructor Update is comprehensive and authored by the ITLS Editorial Board to ensure all pertinent materials are covered. A 20-question quiz at the completion of the program ensures a minimum standard of learning has been met. A passing grade of 80% or higher is required; the quiz may be repeated until the passing score is achieved. The cost is $35.00 USD. Payment can be made with a credit card or with your bank account via PayPal. Access to the online program is instantaneous and can be completed in about 1 hour. The ITLS 8th Edition Instructor Update is intended for current ITLS instructors ONLY. It is not for initial instructor certification. If you are not a current instructor, please do not register for this program. All current instructors are required to complete the 8th Edition Instructor Update before they are allowed to teach from the 8th edition textbook. In order for your instructor recertification card to be issued upon successful completion of this program, you must have also met your ITLS Chapter or Training Centre's teaching requirements. If these requirements have not been met, a new card will not be issued. Thank you for all you do for ITLS worldwide! Don't miss the latest from the ITLS Editorial Board! The Editorial Board has published an update to its "Current Thinking" position paper on the role of TXA in the management of traumatic hemorrhage in the field. "Current Thinking" topics include position papers and documents of use and interest to ITLS instructors, course coordinators, and students. All documents are authored and/or reviewed by members of the ITLS Editorial Board. Thank you for choosing ITLS! Together, we're improving trauma care worldwide.